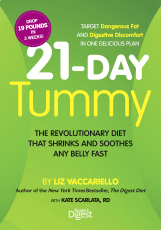 Based on the latest science, the 21-Day Tummy diet targets excess weight and belly fat while addressing the most common digestive disorders. We love to eat but that doesn't mean our stomachs always enjoy digesting what we put in them. Add to this the fact that our nation is heavier than it's ever been, and it's clear that our tummies don't just need to function better, they need to be smaller. In general, smaller stomachs digest food more effectively, and that's why dropping the pounds isn't just a matter of vanity but of health. Featuring carb-light, anti-inflammatory foods, the 21-Day Tummy eating plan slashes inches from your belly (up to 4 ½ inches!) while banishing gas and bloating, heartburn and acid relux, constipation, diarrhea, and irritable bowel syndrome (IBS). 50 scrumptious recipes such as Tomato-Ginger Flank Steak and Almost Pumpkin Mini Pies. tips on how to combat the Four S's -- Supersizing, Sitting, Stress, and Sleep Deprivation. inspirational stories and advice from our successful test panelists. Our top tester dropped 19 pounds in 21 days and completely stopped taking medications for acid reflux. an optional equipment-free workout plan that helps to both sculpt and soothe your belly with a mix of core strengthening, walking, and yoga. guidelines on how to incorporate potentially problematic foods back into your life so you are never deprived of your favorite foods. 21-Day Tummy is a fun, easy guide to healthy eating that will have a smaller, healthier you feeling better than, well, possibly ever!